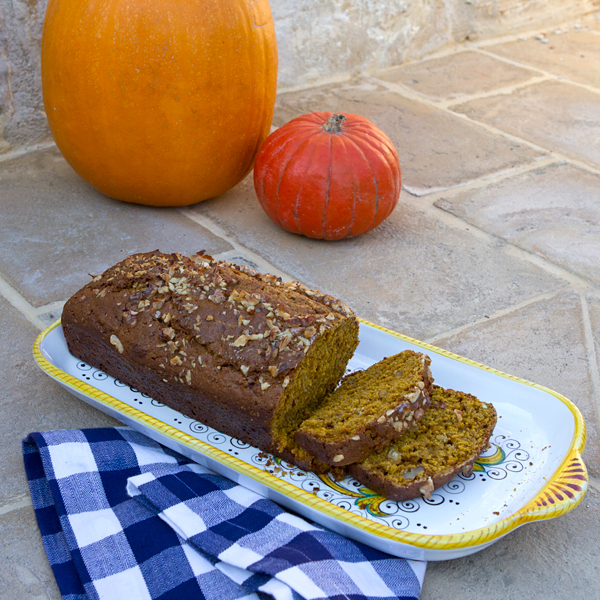 It is pretty obvious looking over recently posted recipes that I am loving pumpkin this fall. I’m not sure why I am so enamored with it, but I have been using it in everything from desserts to soups and stews, and the aroma of this bread baking in the oven is simply intoxicating. 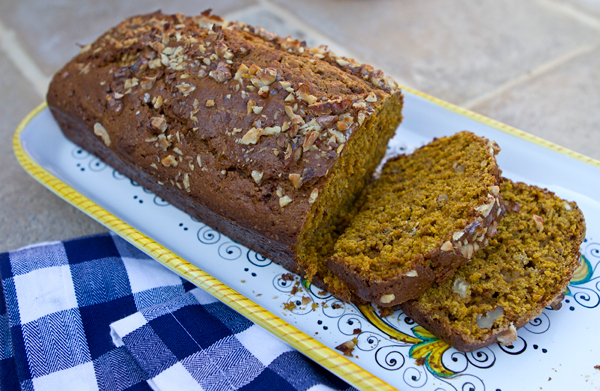 In this moist quick bread, pumpkin adds moistness, a subtle sweetness, and lots of color. I prefer using fresh pumpkin, but feel free to use canned pumpkin (not pumpkin pie filling) if you are short on time. If you find it difficult to find oat flour, simply make your own by processing regular oats in your food processor until fine. To roast whole pumpkins, cut first into halves or quarters, scoop out the seeds, and place on an oiled baking sheet in a preheated 400 degree oven for about 30 to 40 minutes or until the flesh is fork tender. Allow to cool, then use a spoon to scoop out the flesh. If using as a puree, pulse in a food processor until smooth, then place in a strainer above a bowl to allow the excess liquid to drain before using. Combine the flour, baking powder, pumpkin pie spice, and salt in a bowl. Combine the eggs and brown sugar in another bowl, then add the oil and pumpkin puree. Add the wet ingredients to the dry along with 3/4 cup of walnuts, and stir just until combined. Pour the batter into a lightly greased 9 X 5 inch loaf pan. Sprinkle the remaining nuts on top of the batter, and bake until a cake tester inserted into the center comes out dry, about 1 hour. Cool 15 minutes, remove from the pan, and then cool to room temperature before slicing.